← Remote Viewing: Real, Fantasy or Far-Sighted? Three recent mysterious rains: one of fish and … yes, one of money. The fish rain happened in Iran in late April of this year. The fish were discovered on a Golpayegen roadway after rain. An accompanying video shows many small fish, some alive, distributed along a section of paved highway. People appear to have stopped their vehicles to collect the live fish. 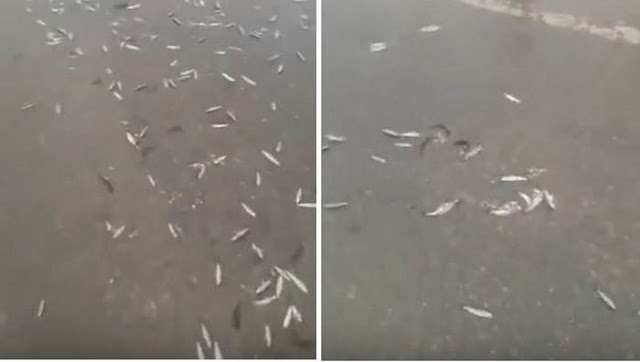 The video that appeared on YouTube shows hundreds of little fish on the road, and some people picking them up. The footage is from a cellphone recording. Also reported on the Iranian Farda news website. If you want to know more about fish rains, and rains of other small animals like frogs, snakes etc. go to my Who is Dumping All that Stuff on Our Heads? article. Money falling out of the sky… would you believe it? Yet, it does happen. It is a rare phenomenon. Although documented in a few cases, there might be more of these money showers that do not get any publicity. I have been able to find about twelve of these cases, some are very recent. The last one was in India, which I am reporting here. In case you might think that someone is throwing money from the roof of a building, there are cases with gold and silver coins. Who would ever throw that away? So far, you have heard this many times that the fish and turtles have fallen from the sky in the rainy season, but perhaps maybe you heard it for the first time that coins are raining with water. It is not one coin, or two, but hundreds of coins. This incident, which seems impossible and strange in the first place, is being reported in Devlochri block of Jaisinagar village. On Wednesday, there were heavy rains with thunderstorms in the district. In the afternoon it was dark with clouds, then in this village, coins start falling from the sky with water. In the village there were dozens of witnesses, including children. People listened to the story and were speechless. Some people went out to collect the coins. Although by that time the rain had already stopped, and some children were seen with coins in their hands in the middle of the rain. Villager Hemraj Pal said that he was returning home after bathing, and that there was a crowd of children near the house, and he was very upset, and asked if the coins from the sky were hot. At first, he did not believe it, but when he came to see the scene himself, it was correct, and he said that as soon as the coin fell, they would make noise hitting the ground. There were all coins of one, two, five and ten rupees. 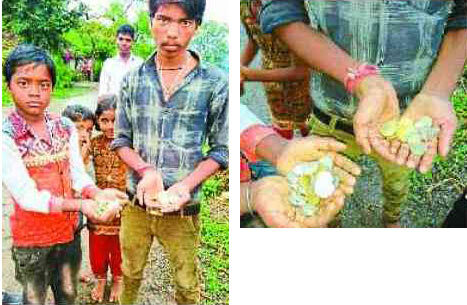 Apart from this, some children of the village, Bira, Shiva, Jaya, Deepesh and Som, have collected hundreds of coins. Coins falling in two to three places. According to information from the villagers, coins have fallen not in one place but in two to three places. Children and adults saw coins fall in the village Panchayat Bhawan, at the river banks and at the hillside. If you want to read more cases in which coins and paper money fell from the sky, and an explanation of the phenomenon behind this and other strange object falling down from the sky, read my article of Anomalous Showers of Stones, Water and Other Objects. This entry was posted in Aliens, Dimensions, earth energies and tagged anomalous, fish, money, mysterious, rain, shower. Bookmark the permalink.